This is a note to self and not an inducement to buy or sell. Verizon is likely to finance 130 bil in half Verizon stock and half debts. That is a hefty 65 bil in debt. The 45% stake, generates 12.87 bil in operating cash flow. This makes the purchase at nearly 10 times operating cash flow. We have to remember this ratio as a yard stick for future purchase and sale requirement. If Verizon is paying for the enterprise value then this is as close to EV/EBITDA as possible. Telecoms are best purchase less than 6 times that and when it gets close to 8-9 times, its frothy. 65 / 12.87 = 5 times. That is a rather uncomfortable some. John Malone, crazy as it seems, likes using cheap debt to buy more assets than pay it down. Does not like to pay dividend. His safety gauge is 4 times net debt to EBITDA. This purchase perhaps is too much leverage. Together with Verizon it is estimated future free cash flow after capex to be 17 bil. If they don’t pay out dividend (should not be possible), they will take 4 years to pay down the debt. Still total outstanding looks 125 bil. Debt is safe only if the cash flow underlying is safe. And cash flow is safe only when telecom is in a dominant position. If there is an active grab of subscribers and Verizon ends up losing, it should result in negative attribution. 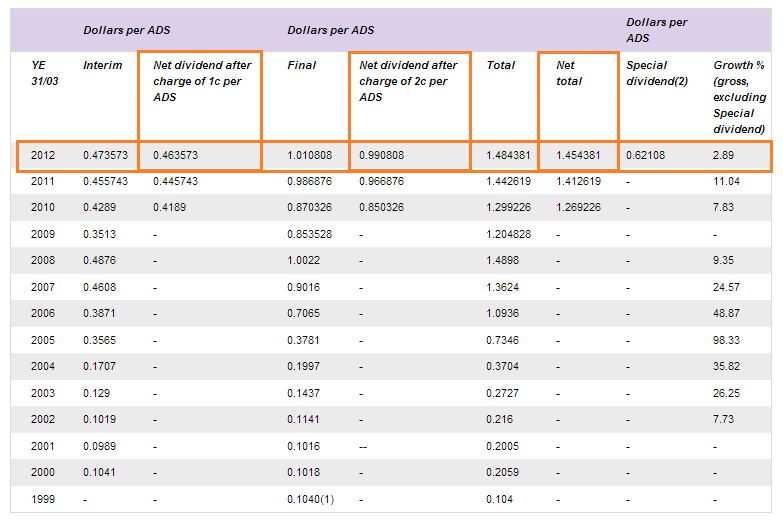 US folks seem to find it challenging to calculate international ADR’s dividend. The primary problem is that international stocks do not have uniformed dividends. Here I will show you how you can get the figures fast and accurate at 2 sites and also talk about the dividend sustainability of Vodafone. See how well the information is structured. Wish SGX looks this easy. Why is it important to check the official site is because some companies charges for handling of ADR dividends. In the case of vodafone there is a total of USD 3 cents charge per share dividend. This provides somewhat of a rough 2% drag to your dividend. 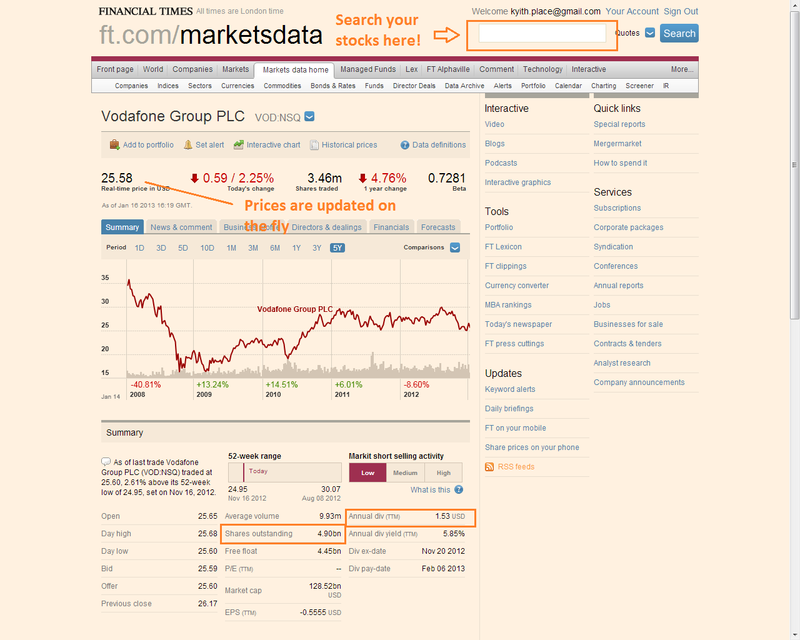 Its funny that how come the latest distribution reflected in NASDAQ was not reflected on Vodafone’s site. Financial Times is a favorite site of mine because you can quickly search for not just US stocks but also international listed stocks. If you don’t believe me, search up obscure stocks like Nam Lee in Singapore, Zhejiang Expressway in Hong Kong. You will be able to find them. 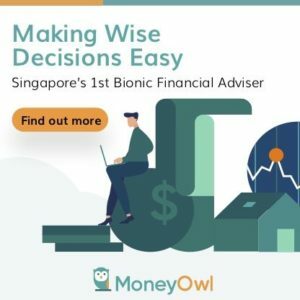 Interestingly you can find 5 years worth of balance sheet, income statement and cash flow statement and price changes here. To top it off the dividend per share is rather accurate for most I see. Here you will see it correspond to NASDAQ.com’s figures. You can also do a quick reference of the number of shares outstanding. 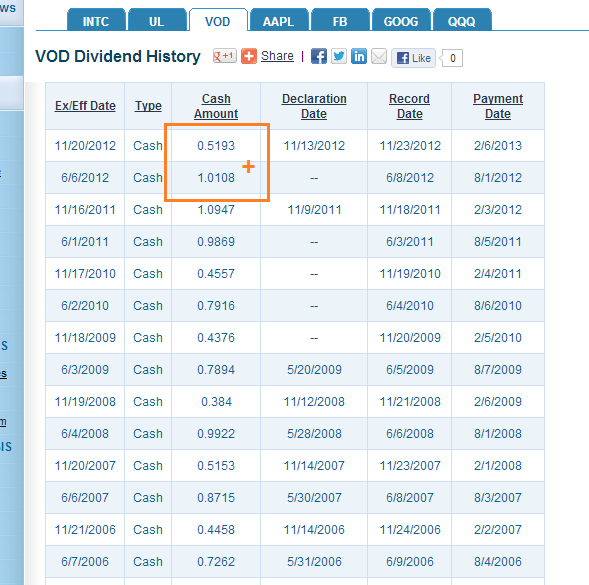 The Dividend Yield currently is thus 1.50/25.58, which works out to be 5.86%. That’s a rather good yield. How much cash flow is required to pay for a USD $1.53 dividend? In the last conference call, the management is still projected a full year free cash flow of GBP $5300 mil. So essentially current dividend is 88% of free cash flow. This does not include the cash flow distribution from 45% owned Verizon Wireless whose distribution are rather uncertained. End state, the cash flow sans Verizon Wireless could sustain the current 5.86% yield. And the Verizon distribution can be used for additional capex or buy back shares to boost future dividends. Still caveat is Europe may have room to weaken in terms of plan downgrades. I don’t expect the next 3 years dividend to be raised 7% per year again. This is a note to self to evaluate Vodafone’s decision to use their cash from Verizon Wireless this way. Personally, I feel they don’t have to be obliged to pay out all cash flow to share holders. At a time when European telco sans Deutsche Telekom is cutting dividends, keeping hold of the dividend make sense. 2 years of 2.4 bil amounts to one year of ordinary dividend. However, the reality is that, unless you believe Vodafone shares are overvalued, a share buyback is the most effective way to return money to shareholders. It achieves the lasting benefit of decreasing the number of shares in issue, which in turn makes Vodafone’s regular dividend payments more sustainable. Either the company can pay the same dividend per share to a smaller number of shares, meaning it has more cash to spend on other things, or it can spend the same amount of cash paying dividends to the smaller number of shares, meaning the dividend per share can grow more than it might have done otherwise. While the rest of Europe’s struggling telecoms sector is being forced into rights issues and dividend cuts, the retention of some of this latest Verizon distribution by not using it all for the buyback will strengthen Vodafone’s balance sheet. Like some sort of spoilt child, the market might want it all – and want it all now – but given the challenges many of its peers are facing it is tough to paint Vodafone’s windfall and ensuing buyback programme as a disappointment or bad news.